The noise is all around you, but you hardly notice, you are deep into your knitting, mindlessly working each stitch, entranced by the clicking of the needles and the soft buttery texture of the yarn between your fingers. The noise about you is merely the passing of sound waves impenetrable to your solidarity, unable to affect you, you are protected by your knitting. In your mind and in your world, there is peace. Let this knitting take you away deep into the world of your thoughts. For there is no better place. Knit from the top down, this shawl can be worked two ways for dramatically different results. Chose two colors, a speckled (or highly variegated) and a solid. You’ll want a nice contrast between the two. As always, if you don’t have an LYS close by, you can order from us at FourPurls.com. 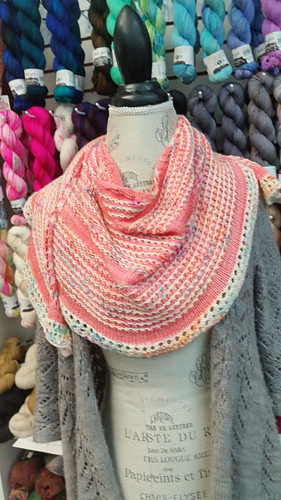 This shawl can be worked two ways for dramatically different results. While each option uses the same stitches there are changes in the amount of times each is worked. In order to make it as simple as possible to follow we have written out each option separately. We hope you make one of each :) After reading through the stitch patterns please continue to the section labeled “Let’s Get Started” there you will find pictures and instructions to get started for both options. The numbers in the parenthesis are for you to check off as you go and coordinate with the row numbers in the sections.